Bhutan Media Foundation is pleased to invite nominations of reporters and editors for a three-day investigative reporting training. Besides investigative reporting skills and techniques, the training will feature mobile journalism as a tool for multimedia. The training will be conducted by two senior practising investigative journalists from India and resourced by senior editors from Bhutan. You are encouraged to nominate woman journalists for the training. Kindly email your nomination to bmf@bmf.bt or accounts@bmf.bt or call us at 02 331709/323784 and extension number 24 to talk to Dawa Tshering. The training is part of the project titled ‘Promoting SDG 16.10: Strengthening Investigative Journalism to Ensure Public Access to Information’ supported by UNESCO New Delhi Office. Ushinor Majumdar is a journalist since May 2011. Based in India, he has worked with Outlook magazine <https://outlookindia.com>, Tehelka magazine and The Hindustan Times. Both Outlook and The Hindustan Times continue to command a pan-India readership; Tehelka did so till it became nearly defunct a few years ago. The last position held was that of Assistant Editor with Outlook magazine, where Ushinor worked from February 2015 to February 2019. He has also collaborated with global investigative reporting organisations and media outlets for cross-border projects. Ushinor’s reportage-based book—‘God of Sin: The Cult, Clout and Downfall of Asaram Bapu’—was published by Penguin Books, released in December 2018. The book is the first in India to make a holistic investigation into the criminal empire of corrupt ‘godmen’ in India. The book can be ordered at https://www.amazon.in/God-Sin-Clout-Downfall-Asaram/dp/0143443135. The author description can be found at: <https://penguin.co.in/author/ushinor- majumdar/>. Ushinor’s investigative and other reports have been quoted and cited in some books. Notable amongst them are Sudeep Chakravarti’s acknowledgement of assistance in Clear Hold Build: Hard Lessons of Business and Human Rights in India (HarperCollins, 2014). The news reports and features have covered a wide variety of stories including corporate corruption, security (including political and minerals- based conflict), judicial corruption, judiciary, governance and environment amongst others—stories that were about people and how these issues affect them directly. There has been a penchant for newsworthiness of the stories and looking beyond the obvious and the headlines. 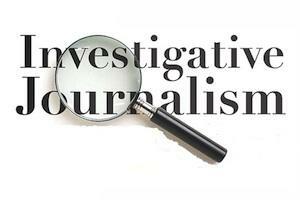 Often, without a conscious attempt to do so, the reports have been classified under a genre of investigative reporting. The environment reportage has included coverage of the 2013 Uttarakhand floods in India, the 2015 earthquake in Nepal apart from other stories, some of which were taken up by judicial authorities for action against the government. The coverage of these natural disasters was syndicated to the global press. Josy Joseph is an award-winning investigative journalist based in New Delhi, author of the critically acclaimed non-fiction book ‘A Feast of Vultures: The Hidden Business of Democracy in India,’ and a Global Fellow at the Edward R. Murrow Center for a Digital World at Tufts University. Josy is now engaged in starting up a multi-lingual media entity. Until August 2018, he was the National Security Editor of The Hindu newspaper. He wrote columns and editorials for the newspaper besides overseeing coverage of security issues and investigative stories. He has been Editor Special Projects for the Times of India, an Associate Editor with the DNA newspaper, and has also been with Rediff.com, the Asian Age, Delhi Mid Day, and the Blitz. Josy is the only Indian writer-journalist to have been honoured with prestigious awards for both his journalism as well as non-fiction writing. Josy’s stories have fostered greater public debate and have contributed to significant policy and systemic changes. His reporting has resulted in several high-profile officials being forced out of office, triggering the arrest of many others as well as federal criminal and military investigations. The Prem Bhatia Trust elected him India’s best political reporter of 2010 “for his scoops and revelations, which include a list of scams that have become familiar names in the political lexicon.” In July 2013, the Ramnath Goenka Foundation run by the Indian Express newspaper group awarded him the “Journalist of the Year” in print media. In 2018, Crossword Book Award jury selected his book ‘A Feast of Vultures’ as the best non-fiction published in India in 2017. Josy holds a Masters in International Relations from the Fletcher School of Law and Diplomacy. Josy graduated from the University of Kerala with an undergraduate degree in Mathematics. He has been a fellow at the Institute of Defence and Strategic Studies in Singapore and is an alumnus of the Colombo-based Regional Centre for Strategic Studies. Josy’s book ‘A Feast of Vultures’ was voted the most popular non-fiction in Amazon’s popular books of 2016.